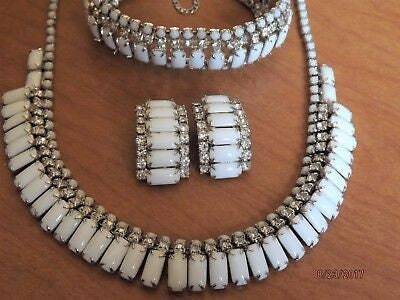 What a dramatic display of white milk glass, rhinestones, and silver! 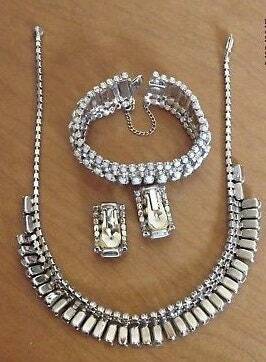 Jewelry combination set of a necklace, bracelet and clip on earrings by Kramer of NY. Emerald cut stones in a dangling necklace splay with rhinestone trim. 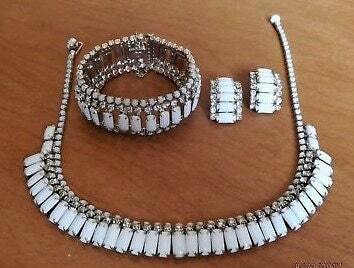 Matching earrings and bracelet are amazing. Could all be worn separately too! Truly a stunning set. Dimensions: 16 inch necklace with a 3/4 inch drop. Bracelet is 7 inches long and 1 inch wide. Earrings are 1 1 1/8 inches long. All pieces are in great shape with no missing or discolored stones.